A very popular roll that we sell is the Philadelphia Roll, or Philly Roll, named after the popular brand name cream cheese. It is a great combination of flavors and many of our clients like to have it for breakfast! We use Philadelphia brand cream cheese and I swear there is a difference. I prefer to use the lightest smoked salmon on the market (Norwegian Smoked is nice). Add one of the two suggested optional ingredients for an extra special Philadelphia roll! So let's get to it and make a great Philly roll! First place one full sheet of sushi nori on your bamboo mat, shiny side down. Lightly cover the nori sheet with your prepared sushi rice - leaving the remaining inch and a half of nori bare lengthwise away from you. Place your toppings lengthwise at center of your rice. Fold your mat over, centering your ingredients with respect to your rice sheet to the far edge of your rice. With even pressure, tighten your roll by pressing and pulling on your mat. Finish your rolling by rolling your tightened roll over the last flap of nori. Repeat the tightening process if necessary. 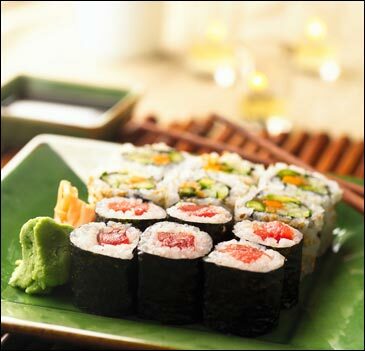 Slice your Philadelphia Roll into eight pieces. And that's it — the perfect Philly Roll! Enjoy!